The government estimates there are 190,000 Muslim women in England who speak little or no English. Ministers are determined to tackle some of what they see as the underlying issues, amid mounting concern about the number of Britons going to Syria to join so-called Islamic State. You can take your pick of popular myths and misconceptions about Muslims in the UK - that their numbers are going through the roof, they're all would-be extremists, that Britain's prisons are filling up fast with convicted terrorists. All make for lurid headlines and speak about Muslims as if they were a single homogenous entity - the "Muslim community" can be a shorthand way of referring to Pakistani and Bangladeshi-origin Muslims - ignoring the fact Britain's many different Muslim communities are highly diverse in terms of nationality, ethnicity and language. 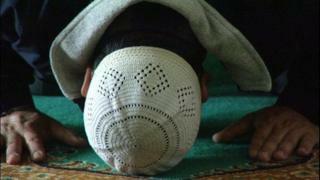 Most UK Muslims are Sunni, but an estimated one in 10 is Shia. When did Muslims arrive in the UK? The first large group of Muslims in Britain arrived about 300 years ago. They were sailors recruited in India to work for the East India Company. The next phase of Muslim immigration to Britain followed the opening of the Suez Canal in 1869. Most of these immigrants came from Yemen. The first mosque in Britain is believed to have been opened at 2 Glyn Rhondda Street, Cardiff, in 1860, although this is disputed. The 1950s saw significant numbers of Muslims from the subcontinent arrive in the UK, prompted mainly by post-War labour shortages. Others - such as Moroccan Muslims - have been present in significant numbers in England since the 1960s. Algerian Muslims arrived more recently, as refugees and asylum seekers. Nigerian Muslims arrived in the 1950s and then again during the 1990s, mainly for economic reasons. Relatively small numbers Egyptians and Saudi Arabians have been present in the UK for decades. Those from Iraq and Afghanistan began arriving more recently, as a result of war and social breakdown. Most of the UK's Muslims hail from Pakistani and Bangladeshi backgrounds. Historically, Muslim migrants from Pakistan and Bangladesh as well as a smaller number of Indian Muslims settled in areas where manufacturing and textiles provided the main employment. These communities made their home in London, the West Midlands, north-west England and Yorkshire, with smaller settlements in Scotland and Wales. Most of the Bangladeshi Muslim community is originally from a single district in Bangladesh - Sylhet. Almost half of this community lives in the London borough of Tower Hamlets and the immediate surrounding area. Much of the Pakistani community in the UK is originally from the Mirpur region. The Pakistani community in Bradford is almost entirely from this region. The Somali Muslim community - 100,000-strong, according to the 2011 census - forms Britain's largest refugee population. Somalis arrived in the 19th Century, heading to port cities such as Cardiff. But it is only in recent years that significant numbers have been coming to the UK. Somalis are among the worst-educated groups in the country. Poverty and unemployment are rife. Language remains an issue in terms of opportunities. The Turkish Muslim community numbers some 66,500, two-thirds of which is made up of Cypriots. Turkish-speaking Muslims have also come to Britain from the war-torn Balkans. Most live in the London area. Nigerian Muslims are believed to make up about 10% of the total Nigerian population in the UK, although precise figures are hard to come by. That's about 16,000 people. The majority are Yorubas from southern Nigeria, together with some Hausas from the north. The Muslim Council of Britain, an umbrella group representing 500 or so different organisations, came to prominence during Tony Blair's Labour government. But some accuse the MCB of not being truly representative of Muslim viewpoints. And ministers have distanced themselves from the organisation. The Muslim population of England and Wales stands at 2.71 million, according to 2011 data, up from 1.55 million in 2001. Even so, according to this survey, Muslims make up just 5% of the overall population. But the Muslim population is growing faster than the overall UK population, because of a higher proportion of children and fewer elderly people. Some 80% of Muslims live in four big conurbations. Just over a million Muslims live in Greater London. One in three Muslims is under 15. That compares with one in five in the overall population. One in 12 of all school-age children is from Muslim a family. By 2021, there are expected to be about 300,000 Muslim teenagers. As a whole, British Muslims are poorer than the general population, less likely to own their own home and more likely to live in deprived areas. Almost one third of Muslims of working age have no qualifications, even though that proportion is an improvement on a decade ago. About 28% of Muslim households occupy social housing - a higher figure than the national average. Within the various Muslim groups, the proportion is highest among those of Bangladeshi origin. Why so many Muslim prisoners? One last statistic causing headaches for policy makers and politicians alike concerns the growing number of Muslims in prison. There has been a big rise in Muslim prisoners - up 122% in the past 12 years compared with a 20% increase in the general jail population. In hard numbers, Muslim inmates are up from 5,502 in 2002 to 12,225 at the end of 2014. In all, just over 14% of the prison population in England and Wales is Muslim. Media reporting might lead some to conclude the increase is linked to convictions of extremists. But Ministry of Justice figures show less than 1% of the Muslim prisoner population is in jail for "terrorism-related offences where the motivation stemmed from extreme ideology". Other factors may be at play, including the increasing number of foreign national prisoners. And in 2010, an official report linked the growth in numbers to the younger age profile and lower socio-economic status of the Muslim population in general compared with the national average. Why the surge in Muslim prisoners?